Historical fiction authors spend a lot of time reading real history. Many years ago, I was reading an 1880s newspapers at the Nebraska State Archives when a news story literally stopped me in my tracks. It was a true mail order bride story. The German Club of Grand Island, Nebraska, had decided there weren't enough German women in the area. Together, they came up with a unique solution. Pooling their funds, they sent "home" to Germany for women. Forty came. The ladies stepped off the train and into a local social hall. Couples paired off and got married. They had to spend their first night in town so that if any of the ladies changed their minds, the marriages could be annulled the next morning. And then they went home. After my initial astonishment at this real "mail order bride" story, my storyteller's imagination began to race, wondering about the whys and wherefores--and the what ifs. After all, Germany is a relatively temperate climate compared to Nebraska. And forested. Western Nebraska knows huge temperature extremes (over 100 in the summer and wind chills of 60 below in the winter are not unusual). As for trees, in the late 1800s there weren't many in the entire expanse of plains. What would that have been like? Married to a stranger in a very strange land. At the time I came across this true story, I'd also been immersing myself in the Solomon Butcher collection of pioneer photographs. 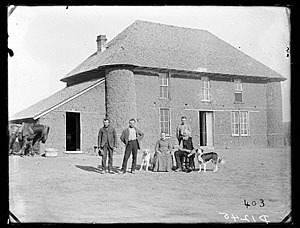 When Butcher's homesteading efforts in Custer County, Nebraska, weren't successful, he came up with the idea of producing a photographic history of the county. His father provided a wagon and a team (pictured at right). 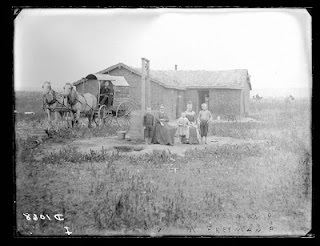 It would have taken Butcher hours to reach some of the homes and families he photographed. He supported himself with a subscriptions, donations, and the sale of photographs to his subject families. In addition to taking photographs, Butcher collected stories. His history of Custer County (Solomon D. Butcher's Pioneer History of Custer County and Short Sketches of Early Days in Nebraska) is replete with first hand accounts of events. One of Butcher's real stories inspired a dramatic scene in my mail order bride story, Karyn's Memory Box, wherein the hero, Mikal, falls into a deep well. immigrants from Belgium. This house inspired a best friend named Celest Delhomme for my mail order bride Karyn Ritter. Perusing the Butcher collection, I've wondered about those women. And about the women who came to Grand Island, Nebraska from Germany and married strangers. I hope there were many happy endings among them. Why do you think we're so fascinated with stories about mail order brides? Stephanie Whitson's mail order bride story, Karyn's Memory Box has recently been re-released in both trade paperback and ebook formats. It will soon be available as an audible book as well. 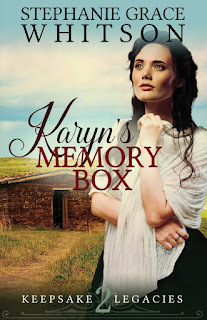 Karyn's Memory Box is Book 2 in the Keepsake Legacies series. I think it's the mystery of it all. Who were these women? What went through their minds during the journey to meet their prospective husbands? Were any of the women rejected by the men? Very intriguing. All good questions! Those are the kinds of questions that kept ringing in my mind, and I finally decided to write a story about the "what ifs" of that situation in Nebraska. Mail Order Brides had to have faith and determination with their uncertain future. It would take understanding and patience going to a new country or territory without having a full understanding of what they would face. Thank you for sharing your discovery about Solomon Butcher and his photography. You're welcome, Marilyn. Solomon Butcher gave history lovers a great gift. You're welcome. Glad you found it of interest, Melanie. Happy Monday ;-)! I think mail-order bride stories are so interesting because they took a lot of guts, especially on the woman's part. We tend to forget that many of those women were desperate with no means of support and few jobs available for decent women. Still, it must have been so hard to travel so far, for weeks and weeks, only to marry a stranger. Arranged marriages of any kind are so foreign to our modern experience, aren't they. We once had a young couple from India in our church. They were Christian, but they had never seen one another until their wedding day. They decided to build a good life together ... and they did. That's what I hoped for when I was writing my version of such a story. I agree with all the comments so far. I think this must have been the pioneer version of online dating. Anyway, I know my daughter and I both love to read about mail-order brides. Love that comparison, Susan, to "on-line dating." Good analogy! Thanks for posting the link to the Solomon Butcher pictures. I just spent nearly an hour looking at them. What fun for a historical writer!